I have put together a list of things to do with your family in February in Dublin and surrounding areas. I find sometimes when you are looking for things to do you totally forget what is on so this is a handy guide that you can keep coming back to. 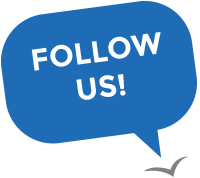 Some events are a little drive outside Dublin but I have linked all events so you can see where they are and what suits you best. Hope it gives you some ideas of things to do! We bring history to life for over a million visitors every year. 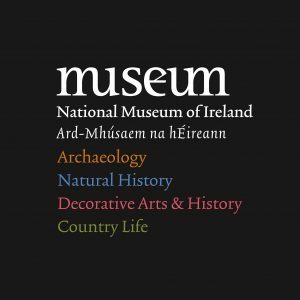 At our three Dublin sites and one in Mayo, the National Museum of Ireland (NMI) holds the national collections of Archaeology, Decorative Arts, History, Ethnography, Folklife and Natural History in trust for the people of Ireland. Our mission is to put people – visitors, staff and partners – at the centre of all that we do, and engage with them in new and creative ways. And with over four million objects in our collections, we have a continual source of inspiration for our programmes. Please click on the link below to discover all the events taking place across the four Museum sites. 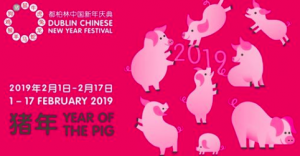 Dublin Chinese New Year Festival marks the Year of the Pig with a two week programme of events from Feb 1 – 17 2019. 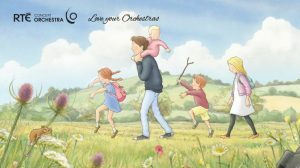 A Lupus Films production in association with Bear Hunt Films and Walker Productions for Channel 4, Universal Pictures and Herrick Entertainment with the support of Creative Europe – MEDIA programme of the European Union. Science & Sport: Mon – Fri 3pm – 6pm. Sat + Sun 10am – 6pm. Junior : Mon – Fri 9.30am – 5pm. A key philosophy at Explorium is to challenge both mind and body so we have also created sporting areas that will encourage our visitors to push their limits. A fun kids’ workshop where we will be making bird feeders to help our feathered friends during the cold winter months. Be sure to wear old clothes since we may be making a mess. Suitable for ages 6-12. Booking Essential. Call (01) 804 0319/ 857 0909 or email botanicgardens@opw.ie to book. 📚Who doesn’t love a good book! 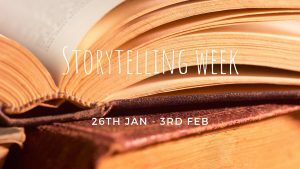 To celebrate storytelling week, join us from the 26th January – 3rd February to enjoy storytime at Airfield Estate. We’ll be reading a selection of children’s books in the Lily Butler room at 12:30 pm and 2 pm. Storytime is taking place each day except on Monday and Tuesday. Drop in and enjoy the magic of a great story. 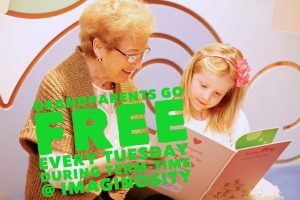 Don’t forget Grandparents go FREE each term time Tuesday at Imaginosity, Dublin Children’s Museum! 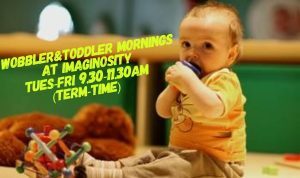 Wobbler and Toddler Mornings take place at Imaginosity every Tuesday-Friday during term time from 9.30-11.30am. Wobbler & Toddler mornings are designed for our youngest visitors and their parents and carers, scheduled during quiet mornings, these mornings allow young children to explore the museum at their own pace, incorporating structured activities that will promote early learning and pre-school readiness. All Wobbler & Toddler activities are included with general admission to Imaginosity. String Play is performed by Mary and Katherine Barnecutt and Matthew Jacobson. 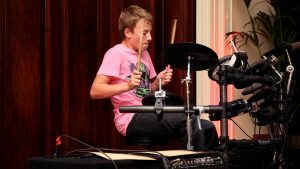 It was devised as part of the ‘Fun Size Jazz’ series, an artist development collaboration between Improvised Music Company and The Ark in 2018, which encouraged jazz and improvising musicians to create new work for young audiences. Is your child a budding chef or do they love to help you out in the kitchen? 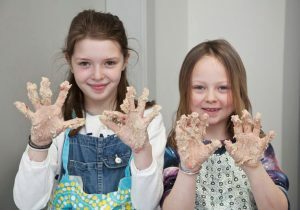 Our kids’ cookery classes might be right up their street! All classes are suitable for 8-12 year olds who love all things food! 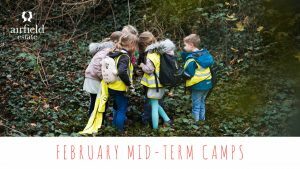 Each class is based on a seasonal theme and will begin by exploring what’s available in the garden and will then move on to prepare and cook a selection of themed recipes. Classes will be led by our education team in a relaxed and fun environment which will allow the children to see the process of food from farm to fork and get hands-on, learning kitchen safety and correct utensil care. There is a charge of €25 per workshop (€22 for Airfield Estate members) and the day will run from 10 am – 12.30 pm. This February at EPIC we are delighted to welcome the Gymboree team to our Tiny Tots Tuesday! Learning is made fun through this workshop of music, dance and games for little hands and feet. 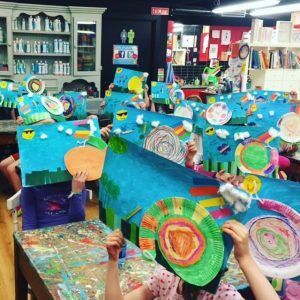 Join our ‘budding’ artists, a creative workshop especially for younger children taking place once a month, under the attentive eye of artist Niamh Synnott. Children are encouraged to take a closer look at the natural world all around them to inspire fun art-making activities. Suitable for 4 to 7 year olds. Perfect for animal lovers and outdoor explorers, we’re running a series of classes for young farmers aged 8-12. Each class will focus on the farm animals at Airfield Estate. 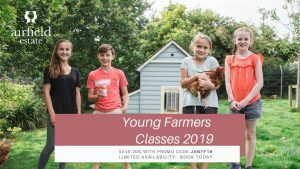 Our team will be working with the young farmers as they get hands-on with life on our farm, learning about our animals and how they’re cared for. Cost: €20 per workshop (€18 for Airfield Estate members) and each day will run from 10 am – 12 pm. Join the Imaginosity Funstigator Team this mid-term break for ‘Curiosity Camp’ and explore the very best Imaginosity has to offer with different daily themes and fun-packed activities. Curiosity Camp will run from Monday 18th – Friday 22nd February 2019 and campers will explore topics including; Science, Engineering, Drama & Movement, Art and much much more, alongside daily supervised play in Ireland’s only interactive children’s museum. Camp runs daily from 9.00am-1.00pm (4-6 years €120 per week) and 9.00am-2.30pm (7-8 years €135 per week) – daily options are also available. Book your child’s place now by calling 01-2176130. This February why not let the kids enjoy a mid-term with a spark of energy at Airfield Estate? Choose from our Adventurers or Explorers camps where kids can experience our urban farm and gardens with a sense of learning and enjoyment. There’s also a new After Camp care which means your child can stay at Airfield Estate until 5.30 pm with full care provided by our education team. With plenty of hands-on learning and simple demonstrations, you will work in small groups to create a set, storyboard and plan for your movie, which you will then film, edit, and record using iPads. Presented in partnership with the Virgin Media Dublin International Film Festival. We run a gorgeous art camp on mid term breaks and school holidays. Come and enjoy some creative arts and crafts projects and of course lots of pottery painting too! Perfect way to get a break from screen time and make new friends in a lovely environment! Projects include pottery painting, foam clay, beads, fabric etc. On 1st day of each camp week glazed pottery project is done. All others days have acrylic pottery projects. Each of the days are themed. Pottery will vary from the image attached – you can always be assured that the quality of the projects is of equal value. Suits Age 5 to 11. Bring a packed lunch. Wear pre-loved clothes. For Drop-off & Collection – if you are in and out of the car park in 15 minutes you don’t need to pay parking fees. Price: €30 per day. Camp day runs from 10am to 3pm (early drop from 9am & late collection is charged at €5 p/hr p/person). This is a very flexible camp – you can book just one day or multiple! Call 01 2960303 – Payment is taken by credit card over the phone at time of booking. Suitable for ages 5 -13 years. €45 one day camp – Family discount applies. 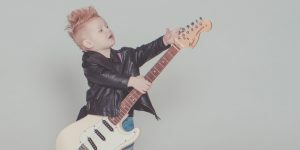 Junior Songschool is for students aged 8 -12 years old who are interested in writing and recording songs, performing them in concert, learning about music technology, and meeting people who love music as much as they do…not to mention forming bands and having fun! Make music and new friends! Please bring your instrument and a packed lunch. Magic is all around us here at Wells and the Hobbit King has heard of its enchantment and has announced his royal visit! The Fairies are not wasting time in organising this spectacular party and you are all cordially invited for a fun-filled day and celebratory Fairy Hunt. Only those who believe in magic to attend. 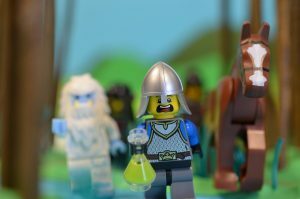 €3 per child for the treasure hunt including a take home treasure – kicking off at 1pm! Ticket to be purchased on the day at Wells House. 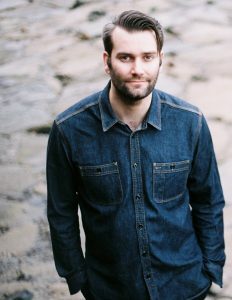 Bring Along a Baby is an informal, relaxed, accessible chamber music recital of the highest standard, aimed primarily at parents, while babies or very young children sleep, feed and play. There is no pressure to keep still or quiet, leaving parents free to sit back and enjoy the music. 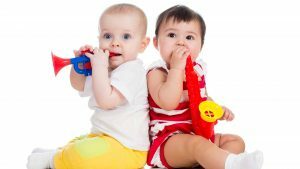 In fact, we encourage the babies to interact naturally with the music, and we have play mats and soft toys to this end. Of course, the babies benefit from the music as well, so it’s a win-win. Hope you like our suggestions!